Yesterday, I had a NEUPOGEN shot given to me to help increase my White Blood Cells. It was given at 1:00 in the afternoon, and I didn't have any major allergic reactions. However, when I went to bed last night, I could not fall asleep, due to a pounding heart rate of 120 beats per minute keeping me awake. It lasted most of the night, and I think I got maybe 2-3 hours of sleep at best. By morning, the heart rate was down to 100 bpm. 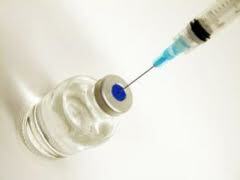 I called my doctor's office to ask about it, and they said I should not get any more of the shots. The concern now is whether or not one shot was enough to increase my WBC's in order to safely have my port surgery on Tuesday. My doctor wants me to have the old port removed as soon as possible, but I don't want to have surgery if my WBC's are too low, as that will increase the risks of infection. So, I will go to the clinic on Monday to have it rechecked, and we will go from there. Jesus---touch my sweet, precious friend! I understand the pounding heart and staying awake. May God give you the rest you need. PRAYING!! So reasuring to know that God is in charge of all your care.